We’re back with another DIY homemade beauty recipe! I’m so excited to share one of my all-time favorite beauty products: a 3-ingredient DIY homemade moisturizer. Yes, if you can believe it, three ingredients is all it takes to moisturize and soothe your skin (and honestly, you really only need coconut oil if you want to go really minimalist!). But I was inspired by SW Basics’ Cream, which uses a simple blend of coconut oil, shea butter and olive oil. Rather than pay someone else to stir these ingredients together, I opted to make my own and the result is the creamiest, dreamiest moisturizer I’ve ever used! 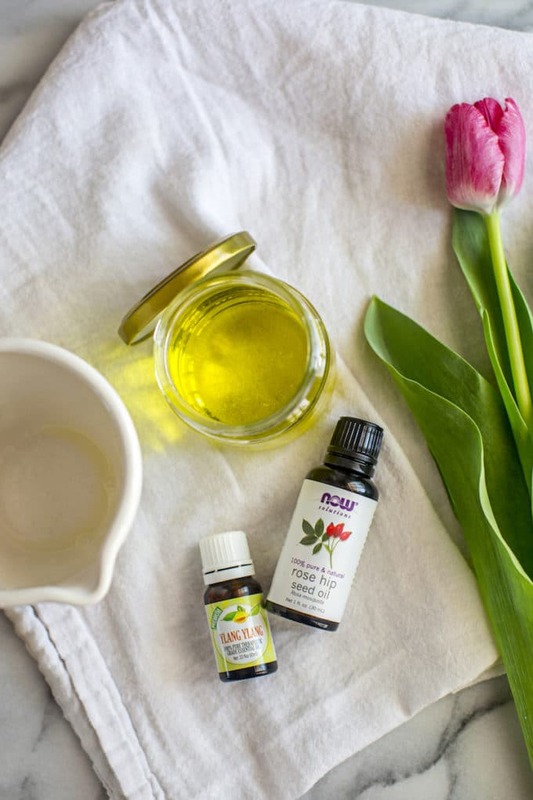 Just a few drops of some essential oils make it smell amazing, not to mention help target specific skin conditions, from sensitivity to acne and wrinkles. Here’s a great guide to choosing the right essential oils for your skin type. I opted for rose hip seed oil and ylang ylang, for a lightly floral scent that is both incredibly moisturizing, healing, anti-inflammatory and oil-reducing to minimize breakouts. But you could use any combination you like–play around with it. See which scents speak to you and which oils work best for your skin. You can also leave out essential oils all together. The first time I made this, I didn’t use any and still loved the moisturizer. It naturally has a light beachy scent from the oils, and it just melts into your skin. For the uninitiated, the moisturizer might feel a bit oily when you first apply, but give it just 10 seconds to absorb and you’ll be left with ultra soft, smoothe skin. Why make your own beauty products? Making your own beauty products is safer. 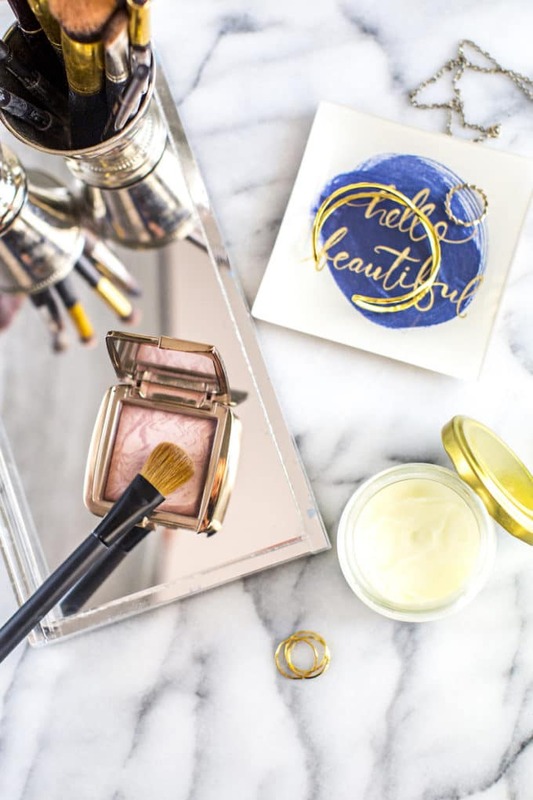 Unfortunately, like most store-bought beauty products, tons of known carcinogens, hormone disruptors and skin irritants make up the ingredient lists of most moisturizers on the market today. Scroll down to the next section where I outline some of the most dangerous ingredients found in popular store-bought moisturizers. Likewise, making your own beauty products lessens your chemical exposure. 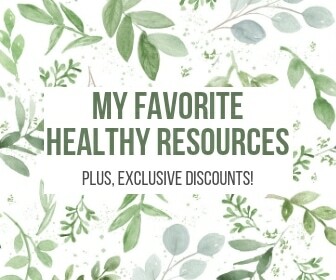 There are a handful of safe store-bought brands out there, but even those often contain dozens of ingredients, upping the amount of chemicals we put onto our skin (and thus into our bloodstream) every day. When you can get the job done just as effectively with just a handful of safe, food-grade ingredients, why take the risk? Making your own beauty products is cheaper. To make this exact recipe, I spent $15 on the raw ingredients (I actually got the coconut oil for free with my first Thrive order, but normally it’s $7.99 on Thrive), $6.95 on the shea butter (also available on Thrive) and essentially nothing on the olive oil since I already had it on hand to cook with–though if you want to get technical, 1 tablespoon of olive oil cost me roughly $0.13 as I bought a 2-liter bottle from Costco for $17.09). But I didn’t use the entire jar of anything, so the exact recipe actually only cost me $4.63 to make: $3.96 for 1/2 cup of shea butter, $0.54 on 2 tablespoons of coconut oil and $0.13 on 1 tablespoon of olive oil. Find a moisturizer under $5 that’s as effective and safe as this one… I really don’t think it’s possible. Making your own beauty products is easy. I’ve said it before–if you can measure liquid into a tablespoon or a cup, you can make your own beauty products! It’s really that simple. In a matter of minutes, this moisturizer can be yours–and it lasts for 6+ months! 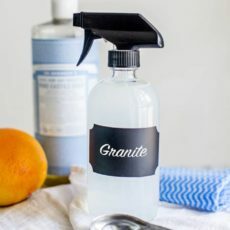 I hate to be a Debbie Downer, but I feel like I would be doing y’all a disservice if I didn’t shed some light on the toxins found in so many store-bought products. I’m not trying to be extreme or scary–but I think it’s important to know what you’re putting on your skin, and ultimately into your bloodstream. CeraVe: Yes, the same “dermatologist recommended” brand that is supposed to be so gentle and kind to your skin. Their moisturizers are full of parabens (which cause reproductive and hormonal problems) and also contain other endocrine disruptors like octinoxate and homosalate. Not so gentle, after all. Olay: Another top-selling brand, Olay’s moisturizer contains a slew of various parabens (6 to be exact), not to mention fragrance, benzyl alcohol (an allergen that’s classified as expected to be toxic or harmful by both Canada and the EU), polyacrylamide (a synthetic ingredient with high contamination concerns) and a handful of other toxic chemicals rated a 3 or higher by the EWG. St. Ives: Yep, another best seller at drugstores, St. Ives’ moisturizer contains 8 harmful ingredients, from pore-clogging mineral oil (which is made from petroleum) to fragrance, triethanolamine (a human immune and respiratory toxicant or allergen) and linalool (another synthetic fragrance ingredient that has been recommended to be restricted in cosmetics by the International Fragrance Association Codes & Standards). Aveeno: Yet another brand that’s always touted as being extra gentle, Aveeno’s moisturizers have some of the highest ratings on EWG, with many scoring above a 6 for their inclusion of harmful ingredients, like fragrance, oxybenzone (studies have shown this causes significant photoallergenic or allergenic effects) , methylisothiazolinone (an allergen causing skin and respiratory irritation), octinoxate and retinyl palmitate (which the FDA has declared a known human reproductive toxicant). Philosophy: Lest you think it’s just the drugstore brands that use toxic chemicals, the fancy-pants, pretty-packaging brands sold at Sephora and department stores aren’t any safer. Hope in a Jar wins almost every award for being one of the best moisturizers, but did you know it contains parabens, retinyl palmitate, geraniol (which is a known human immune system toxicant or allergen) and even diazolidinyl urea (which is a formaldehyde releaser)? Other toxic brands include Clinique, Murad and Kate Somerville, among others. A good general rule of thumb is that if you can’t pronounce it, or if you wouldn’t know where to buy the ingredient in a store, then you probably shouldn’t put it on your skin. Some other brands to avoid: L’Oreal, Neutrogena, Boots No 7 and Clean & Clear, among others. I hope this sheds some light on why it’s so important to read your labels and lower your toxic chemical load. To evoke real change, the best thing we can all do is to vote with our dollars and stop buying products from companies who knowingly include harmful ingredients. 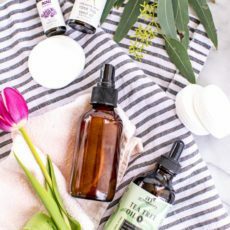 I recommend reading this story on the top 10 toxic skin care ingredients to avoid and looking at EWG’s Skin Deep to learn more about what’s really in our products. 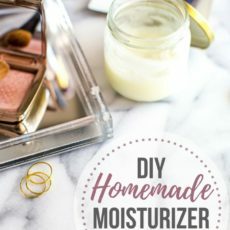 OK, back to happier things: this DIY homemade moisturizer will leave your skin soft, smooth and glowing. YES! Give it and try and tell me about your results in the comments below! 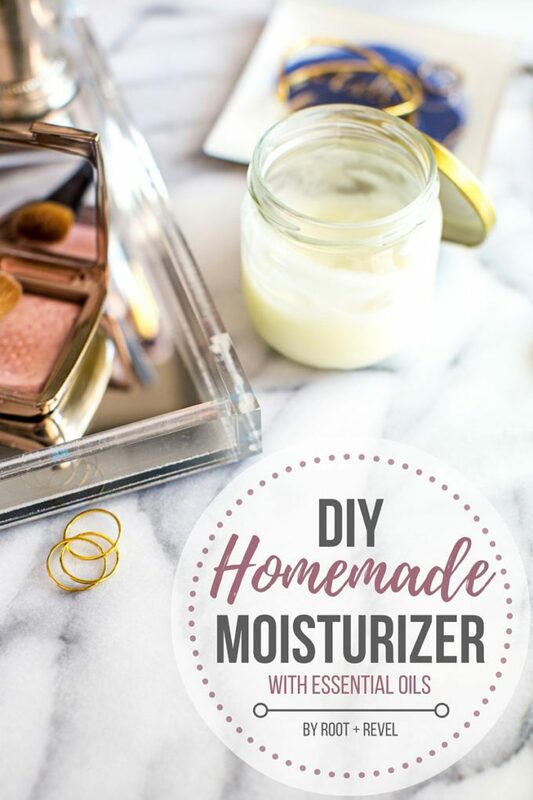 With just 3 ingredients, this DIY homemade moisturizer will leave your skin soft, smooth + glowing! Add essential oils for a major boost! Add all of the ingredients to a large glass bowl with high sides. You won't be able to mix them together yet, as they'll be solid. Bring 2 cups of water to a simmer in a sauce pan. Once water is simmering, add the glass bowl above, being careful to ensure no water gets into the bowl. Allow the butter and oils to melt, stirring occasionally to combine. Once the mixture is melted and combined, carefully remove the glass bowl from the water and pour the mixture in a glass jar (I recommend these). Allow the mixture to cool. Once the mixture has cooled, place in the refrigerator until it solidifies completely. Remove and store at room temperature. To use, apply a pea-sized amount of moisturizer to clean skin. This recipe will last for 6 months of twice-daily moisturizing. I have tried this moisturizer and I absolutely love it so thank you so much for sharing it with us. I just have a little problem and maybe you would know what to do. As I said I adore this moisturizer BUT it’s not enough for my dry skin, my skin feels fine but I feel it needs a little more moisture. Maybe I can add any ingredient or combine it with other products? What would you do? Help please! Thank you so much! Cristina. What is the shelf life of your 3-ingredient homemade moisturizer? I’ve had it last 6 months; you should be able to smell it if it starts to go rancid. Hi! I just found your site and I’m new with all that homemade cosmetics products. 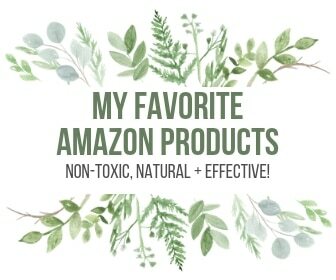 I already bought some oils and other products but didn’t start to use them because i don’t know what is OK to mix and what isn’t. I am 36 y/o and have regular/semi dry skin, with start of slightly pigmentation and small wrinkles beside eyes and mouth. What kind of combinaion wuth those oils could help for that problems? and what should be the proportions? And- do you have any moisture remedy without coconut or olive oil? Thanks for all you are doing!! I leran alot from you blog, but yet not feel confident to start it by myself..
Hey Ruet – congrats on giving this all a go! You could try avocado oil instead of coconut or olive. Lavender is great for wrinkles around the mouth. Rosehip is amazing for wrinkles too and age spots, so possibly try combining those two with your carrier oil (like Avocado) with some Vitamin C drops to help with the pigmentation. As far as the proportions go, look at the recipe in this post for guidelines. Hope this helps get you started! 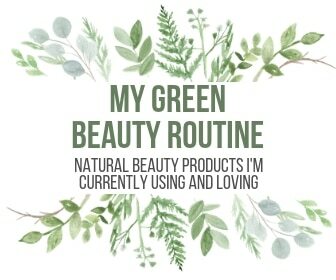 I am new this DIY beauty product. Can I substitute olive oil with jojoba oil? I’ve used the S.W. Basic cream and not a fan of the olive oil smell. Been using this for a week all over my body it’s lovely. Thanks for the recipe. It’s just the right consistency. Did you use 10 drops of each essential oil in the recipe? 10 Rose Hip Seed Oil and 10 Ylang Ylang? I found your blog and getting ready to order the ingredients and just wanted a little more clarification. I’m so sorry, I meant Kate, not Jane. My apologies. I use 1:1 ratio of solid to lquid carrier oils. Shea butter is solid, rest are liquid at room temp. So, for example, 1 cup Shea to 1 cup mixture of liquid carrier oils, such as avocado, Young Living V-6 oil, Rosehip seed oil. Melt Shea, let cool to jelly-like then whip in the rest of liquid. Makes ~2C. Rosehip has short shelf life, so out some in small container and store rest in refrigerator. Now I have the base ready, and I can add any essential oil to it as needed during application. Questions? I think I’m understanding. You are including any essential oils that are added as part of the liquid ratio in the 1 cup of liquid carrier oil? Yes – but I recommend you start with less and then add more to your liking so you can control the amount and balance of scent you prefer. Hope you love it, Kim! 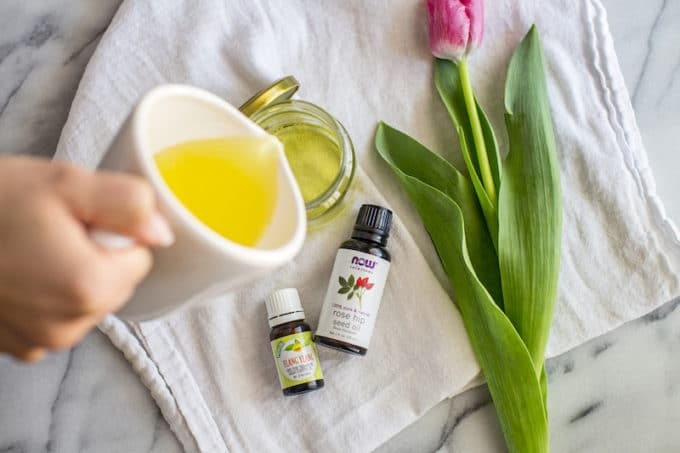 Rosehip seed oil is a carrier oil, so I add 2 teaspoons of this along with other liquid carrier oils to make the 1:1 ratio of liquid and solid carrier oils. When finished, I have a basic body cream, and can add whatever essential oil I want for the particular purpose as I go along. Just put some basic cream in the palm of your hands, and add a drop or two of essential oil, mix, and apply. Hi! 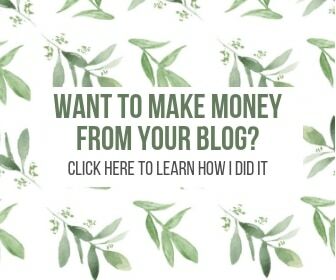 I just found your site and I’m loving it! I can’t wait to re-do my beauty drawer with healthier options. Problem -I’m allergic to coconuts. Is there another option for the coconut oil in this recipe? I know everyone swears by coconut oil as a moisturizer but I can’t use it. 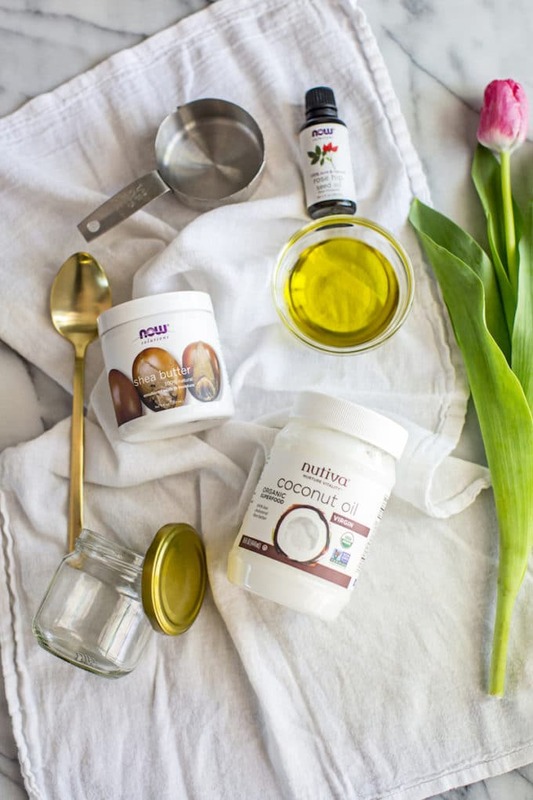 You can use avocado oil, jojoba, almond – see what works best for you! Thanks! I have been using the face oil actually and I’m really enjoying it so I’ll just keep that up. A coconut allergy is challenging as I move forward toward more natural health + beauty options – it seems like they’re in everything! I just tried this and it came out so liquidy! I must’ve done something wrong as I’m not quite sure why it’s such a thin consistency. Do you have any suggestions? Thank you!! Hi, Becca: I’m so sorry to hear that. Did you follow the recipe to a T or switch a few things up? Also did you refrigerate the mixture when you were done? It’s liquid when it’s hot but it will solidify once cooled. Thanks! I melt the Shea butter, let it cool till it thickens a bit, but not solid, then whip in kitchen aide. when it start getting fluffy I slowly add fractionated coconut oil, olive oil, and a small amount of rosehip oil. I use one part shea to one part liquid oils. Keep whipping until fluffy and spreadable. I have contact dermatitis and have found this skin cream to be extremely helpful! Thank you so much!! Wow, love this Jane! Sooo happy to hear how helpful it’s been for you! Thanks for sharing. Ordered the lacking ingredients today! Cant wait! This is amazing. Moisturizers can be so expensive! Can’t wait to try this out. I’ve been using this for a few months now and I can really feel the difference! Thank you for sharing. Oh, I just saw your post about the mask which I assume is how you exfoliate! Is this what you use as your face moisturizer? And how about an exfoliator? Do you use store bought? 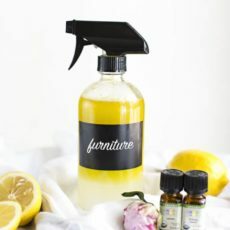 I am going to try this recipe and your toner! Thanks! Yeah I did! The only thing I can think of is that my shea butter may not have been exactly 1/2 a cup since it was in chunks. When I took it out of the refrigerator it was fine but then I put it in my bathroom and it liquified. It’s possible, but I wouldn’t imagine that it would make that much of a difference if it wasn’t exact. Where do you live? It’s possible it’s just too hot and/or humid to keep the oils solidified at room temp. You could always just keep it in your fridge, or use it as a face oil instead. Hope that helps!